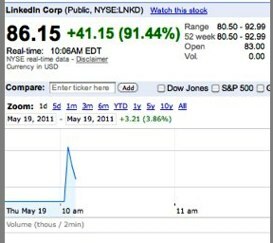 This is a big day for professional social network LinkedIn, which was founded in 2003. 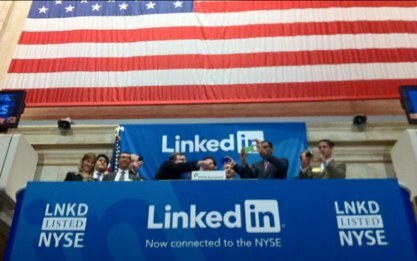 After filing its S-1 with the SEC in January, the company has begin trading its shares, under the symbol LNKD, on the New York Stock Exchange this morning. 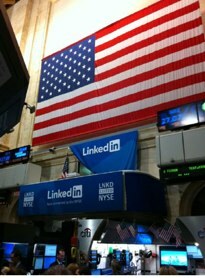 As we learned yesterday, LinkedIn priced its IPO at $45 per share, giving the company a valuation of $4.5 billion. Today, the company began trading at $83.00 per share, a 84 percent increase from $45 per share. That’s a $7.8 billion market cap. It’s now up to $90 per share, but is fluctuating. LinkedIn is offering a total of 7,840,000 shares and is looking to raise as much as $406 million in the offering. Currently there are 94.5 million shares outstanding plus 1,176,000 shares to cover over-allotments. If the company sold the over allotment, LinkedIn’s valuation could be as high as $8 billion. The company just reported that Q1 revenue in 2011 was up 110 percent to $93.9 million. Net income increased to $2.08 million, from $1.81 million in Q1 2010. LinkedIn says it will use the funds from the offering for general corporate purposes, including working capital, sales and marketing activities, general and administrative matters and capital expenditures. The funds could also be used for acquisitions or investments in complimentary technologies. 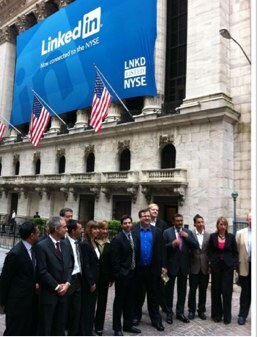 Here’s LinkedIn’s announcement announcing its debut on the NYSE. Related Posts: Attn Entrepreneurs: Mark Zuckerberg Isn’t the Role Model. Reid Hoffman Is.